"Kirby Super Star, known in Europe as Kirby's Fun Pak and in Japan as Kirby Super Deluxe (星のカービィ スーパーデラックス Hoshi no Kābī Sūpā Derakkusu, lit. "Kirby of the Stars Super Deluxe") is a 1995-96 platforming video game developed by HAL Laboratory and published by Nintendo for the Super Nintendo Entertainment System video game console. It was first released in Japan on July 31, 1995, in North America on September 23, 1996, and in Europe on November 13, 1996. 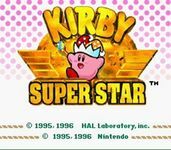 Kirby Super Star's box art states that the game features eight games in one cartridge. Most of these games offered are mostly platforming-oriented, while some others are mini-games." Source: Wikipedia, "Kirby Super Star", available under the CC-BY-SA License.